UV photodiodes are inexpensive too. True if you wanted to use an ordinary lux meter, a fluorescent material is needed. But with a grating there is no need for the visible light filter, and since 365nm is a component of sunlight, you don’t need the UV filter. The meter will either detect it (which is fine) or attenuate it. Thanks for this detector exekutive and welcome to BLF. My brief search didn’t turn up any inexpensive flux meters using it but if you know of one please let us know. Wonder if you can just replace the sensor in one of those cheap meters? I see you haven’t posted much (neither have I) but that doesn’t mean you aren’t familiar with the forum. People here are focused on flashlights and budget so spending a few hundred dollars on test equipment is generally (not always) not an option. People are always receptive to new ideas so please do help us out with your knowledge of this topic. I realize that the UV filter was to keep UV out of his light meter. I was trying to explain how it isn’t necessary. (had a little typo there sorry). I also realize that this is a flashlight forum, and that most people aren’t interested in this — in fact they probably won’t be reading this far down. My comments were directed at djozz or anybody who is interested in/might attempt this experiment. The detector simply drives a current proportional to the incoming light. In fact they give you an example circuit right in the datasheet (it looks like about a dollar or two in parts). Coincidentally, the setup is very affordable and well within the budget range of somebody who can afford a fancy flashlight. Part of why my method measuring UV leds is how it is, is because it developed out of measuring white leds first. It was very rough at first and now it is finetuned a bit but does not have the accuracy of white led testing. It seems to work, and that is always a valid reason to stick to a method. There will be other approaches indeed, the most obvious one is leaving out the fluorescence step if you use a UV detector instead of a luxmeter and go from there. UV detectors do introduce new sources of error: i.e. the sensitivity slope in the wavelength area of measurement can cause significant errors: in case of the detector that you linked: a led with peak at 365nm will be measured higher than a led with peak at 370nm (5nm peak difference is a common variation among “365nm” leds). If you have not also measured the spectrum to correct for that (which I usually have not done) a 10% error is easily made. I know that the ZWB2 filter in my set-up does a similar thing but I hope (not measured) that the U-glass that I use in my current method has a reasonable flat radiationpower-to-visiblelightoutput response over my usual around 365nm wavelength measuring range. One thing that I learned from measuring white leds is that it is not obvious to measure total light output of a source if the beam profile differs from source to source. In that case you need some integrating device. My current method does provide some integration by projecting all radiation onto a fluorescing surface and measuring the resulting fluorescing light in my usual integrating sphere made for visible light. Not perfect but it does to quite some extend compensate for different beams. If a UV detector is used, also an integrating device is needed and if the UV light is bouncing around in an integrating sphere I must determine if the reflectivity of the sphere’s inner surface does not vary too much for wavelength differences. Because the light undergoes multiple reflections before reaching the detector, small differences get multiplied. -fear of the new, can I learn the new stuff? (electronics, computer stuff, interprete datasheets etc. ), and will I ever be able to sufficiently first measure then solve all the causes of error in a new to be developed method. The detector is a wideband device (UVA+UVB+UVC, 221 to 358 nm). They have other devices for other wavelengths. The data sheet provides a spectral response graph, so with a bit of back-of-the-envelope calculation, or spreadsheet math, I think you could get within a couple of percent error. The amplifier circuit has only 4 parts, which you could pop into a breadboard. No equipment required. It’s perfect for a beginner. One thing that I learned from measuring white leds is that it is not obvious to measure total light output of a source if the beam profile differs from source to source. I think in this situation where you’re comparing products, the most important thing is consistency and reproducibility. The relative measurements are the only thing you’re interested in. Because the light undergoes multiple reflections before reaching the detector, small differences get multiplied. The ideal setup would use slits to sample the light, and be performed in a lightproof enclosure. You could also take several measurements while rotating the emitter through 180deg to get an angular intensity profile. Devices which measure total light output are spherical and fairly sophisticated. I know too well. Anyway, I thought I’d throw some ideas out there. I think your tests are very good. Independent testing like this is very valuable to people trying to make purchasing decisions, so thank you. Never be afraid of learning new stuff! I’m always glad I did. To compensate for a non-flat spectral response of a radiation detector you can not do some post-measurement correction calculation unless you know the spectrum of the radiation source. The only way is to use a dedicated optical filter before the detector that fixes the non-flatness of the detector response. Such filter-detector combinations are usually very expensive. I still think that you under-estimate the importance and difficulty of integration of the radiation in total light output measurements. Anyway, I hope that someone will do all those nice things that you propose (not meant in a cynical way ), thanks for the suggestions and discussion, I hope it will be picked up by someone. Me, I have so many nice little hobby projects on my list that for UV tests I will stick to what I do now until someone else does it better (hence the mention “final” in this threads title). you can not do some post-measurement correction calculation. You can. That is exactly what response curves are for. By the way, this is after passing through a diffraction grating + slit , so you are starting with fairly monochromatic light. I don’t underestimate it at all. As I mentioned, the apparatus which labs use for measuring TOTAL output is fairly sophisticated. But I think for the purposes of comparing one LED to another, measuring at 0deg from the emitter (usually peak intensity) will get you pretty good idea. As I said, you could measure at a few different angles in case the emitter has some weird profile. In regards to the fluorescent source, I think quinine (ordinary tonic water) might make a good candidate. You could start with a fresh sample for each measurement in case there is some bleaching. You see I’m looking for smaller emitters that I can spread over a larger area, for even diffused light, rather than a point source like for a flashlight. Stray visible or IR light is of no consequence to me. I’m only concerned with output below 400nm. The lowest power 365nm emitter that I tested was a “mid-power” Vishay led. Ultimately I’m interested in leds that are useful in flashlights. But I will think of testing some lower powered 365nm leds in the future. Yes, the Vishay was interesting. Very efficient. At $3 it’s not so hard on the wallet too, but it is probably still too high-end for my purposes. The 5mm leds you linked do not even mention a wavelength, just “purple”, and no output either. So I guess around 400nm and max 90mW at 20mA. I do not have a proper calibtration yet for 400nm leds so this led would not be first in line. But at that cost I am very skeptical. So I guess … max 90mW at 20mA. 90mW is way too much. The 5mm T1 variety will not be much over 10. These Everlight ones have the same advertised output as the Vishay, but cost 30% less. The 90mW was assuming 400nm, at least I have a 5mm 400nm led that claims 90mW output. I ordered some inexpensive LEDs and a filter for testing. We’ll see how it goes. Instrument Systems offers complete measurement solutions for UV-A, -B and -C radiation starting from 200 nm. The operation of the well-proven Instrument Systems spectroradiometers, e.g. CAS series, with integrating spheres made from PTFE facilitate high sensitivity measurements of UV radiant flux. All Instrument Systems UV measurement solutions with PTFE integrating spheres are delivered with a PTB traceable calibration. OK, who is going to buy first? I have been having trouble with getting parcels from China lately. Postal workers probably dumped them in the river during the strike action last winter. 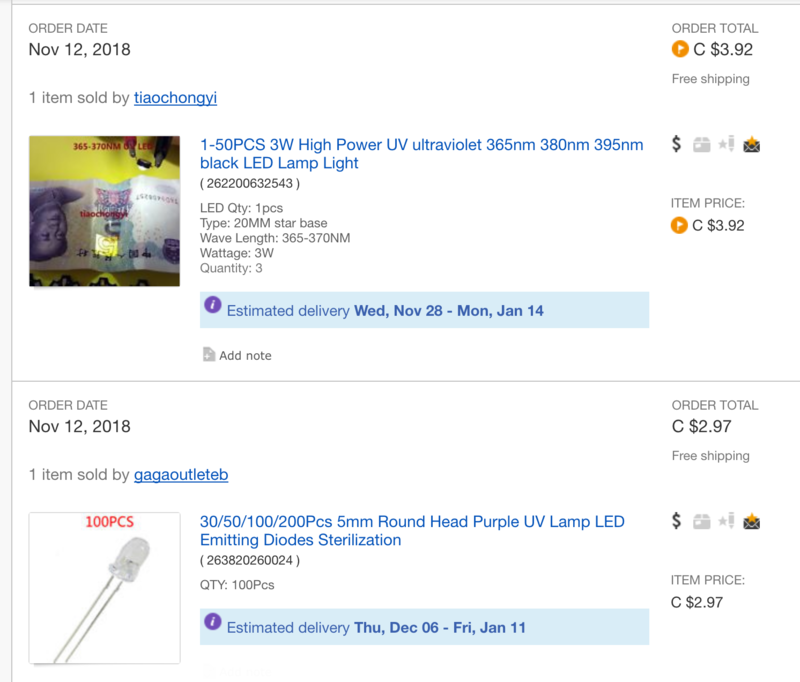 I had to reorder the digital UV sensor, and 3W UV LED because they never came. The ZWB2 filter came, but it’s absolute shite. It lets through lots of visible light.